The population has been rising in a rapid state and so is the demand of basic necessities like food requirements. Today agriculture demands increase in yield with a substantial decrease in chemical fertilizer and pesticides that are responsible for huge environmental degradation. Today a huge part of yield has been lost due to various stresses plant are subjected too. It could be broadly divided into biotic and abiotic stress. Meanwhile, plant growth promoting rhizobacteria has promised us a substantial agriculture development platform. These are generally a group of microorganism that is found either in the plane of the rhizosphere or above root impacting some positive benefits to plants. These stresses include but in no sense limited to ion toxicity, pathogen susceptibility, physiological disorder, salinity, temperature, flooding, pH etc. In response to the above-mentioned stresses plant with PGPR exhibits various sorts of response to handle these unfavorable conditions. They could be further divided into direct and indirect mechanics. PGPR has shown both synergistic as well as antagonist interaction with microorganism inhabiting in near surrounding to boost plant favorably. This review has tried to undertake all possible mechanism of PGPR along with reported studies for various possibilities through which sustainable agriculture development could take place. This review has tried to understand the mechanism to take PGPR at a commercial level under bio-fertilizer. 1. Ladeiro B. Saline agriculture in the 21st century: Using salt contaminated resources to cope food requirements. J Bot. 2012: ID 310705. 2. Glick BR. Bacteria with ACC deaminase can promote plant growth and help to feed the world. Microbiol Res. 2014; 169: 30-39. 3. Rengasamy P. World salinization with emphasis on Australia. J Exp Bot. 2006; 57: 1017-1023. 5. Galloway JN, Townsend AR, Erisman JW, Bekunda M, Cai Z, Freney JR, et al. Transformation of the nitrogen cycle: recent trends, questions, and potential solutions. Science. 2008; 320: 889-892. 6. Butterbach-Bahl K, Baggs EM, Dannenmann M, Kiese R, Zechmeister-Boltenstern S. Nitrous oxide emissions from soils: How well do we understand the processes and their controls? Philos Trans R Soc B. 2013; 368: 20130122. 7. Armada E, Portela G, Roldan A, Azcon R. Combined use of beneficial soil microorganism and agrowaste residue to cope with plant water limitation under semiarid conditions. Geoderma. 2014; 232: 640-648. 8. Calvo P, Nelson LM, Kloepper JW. Agricultural uses of plant biostimulants. Plant Soil. 2014; 383: 3-41. 9. Glick BR. Plant growth-promoting bacteria: mechanisms and applications. Hindawi Publishing Corporation, Scientifica: Waterloo, Canada, 2012. 10. Walker TS, Bais HP, Grotewold E, Vivanco JM. Root exudation and rhizosphere biology. Plant Physiol. 2003; 132: 44-51. 11. Beneduzi A, Ambrosini A, Passaglia LM. Plant growth-promoting rhizobacteria (PGPR): their potential as antagonists and biocontrol agents. Genet Mol Biol. 2012; 35: 1044-1051. 12. Dobbelaere S, Vanderleyden J, Okon Y. Plant growth-promoting effects of diazotrophs in the rhizosphere. Crit Rev in Plant Sci. 2003; 22: 107-149. 13. Kloepper JW, Lifshitz R, Zablotowicz RM. Free-living bacterial inocula for enhancing crop productivity. Trends Biotechnol. 1989; 7: 39-44. 14. Bashan Y, de-Bashan LE, Prabhu SR, Hernandez J-P. Advances in plant growth-promoting bacterial inoculant technology: formulations and practical perspectives (1998-2013). Plant Soil. 2014; 378: 1-33. 15. Tariq M, Hameed S, Yasmeen T, Zahid M, Zafar M. Molecular characterization and identifi cation of plant growth promoting endophytic bacteria isolated from the root nodules of pea (Pisum sativum L.). World J Microbiol Biotechnol. 2014; 30: 719-725. 16. Gupta A, Gupta R, Singh RL. Microbes and environment. In: Principles and applications of environmental biotechnology for a sustainable future. 2016; 43-84. 17. Ahmad F, Ahmad I, Khan M. Screening of free-living rhizospheric bacteria for their multiple plant growth promoting activities. Microbiol Res. 2008; 163: 173-181. 18. Martinez-Viveros O, Jorquera MA, Crowley DE, Gajardo G, Mora ML. 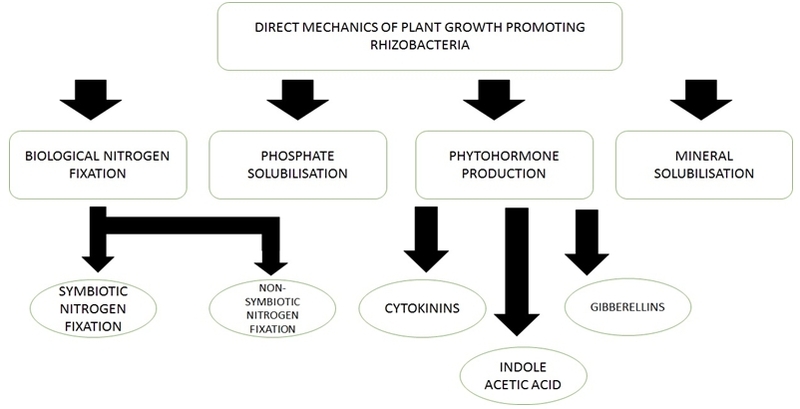 Mechanisms and practical considerations involved in plant growth promotion by rhizobacteria. J Soil Sci Plant Nutr. 2010; 10: 293-319. 19. Dey R, Pal KK, Bhatt DM, Chauhan SM. Growth promotion and yield enhancement of peanut (Arachis hypogeal L.) by application of plant growth-promoting rhizobacteria. Microbiol Res. 2004; 159: 371-394. 20. Choudhary DK, Sharma KP, Gaur RK. Biotechnological perspectives of microbes in agro-ecosystems. Biotechnol Lett. 2011; 33: 1905-1910. 21. Nakkeeran S, Fernando WGD, Siddiqui ZA. Plant growth promoting rhizobacteria formulations and its scope in commercialization for the management of pests and dideases. In: PGPR: biocontrol and biofertilization. Siddiqui ZA, ed. Springer, Dordrecht, The Netherlands, 2005: 257-296. 22. Gray E, Smith D. Intracellular and extracellular PGPR: commonalities and distinctions in the plant-bacterium signaling processes. Soil Biol Biochem. 2005; 37: 395-412. 23. Hayat R, Ali S, Amara U, Khalid R, Ahmed I. Soil beneficial bacteria and their role in plant growth promotion: a review. Ann Microbiol. 2010; 60: 579-598. 24. Singh SR, Joshi D, Singh P, Srivastava TK, Tripathi N. Plant growth-promoting bacteria: an emerging tool for sustainable crop production under salt stress, in bioremediation of salt affected soils. Indian Persp. 2017; 101-131. 25. Ahemad M, Kibret M. Mechanisms and applications of plant growth promoting rhizobacteria: current perspective. J King Saud Univ Sci. 2014; 26: 1-20. 26. Anith KN, Momol MT, Kloepper JW, Marois JJ, Olson SM, Jones JB. Efficacy of plant growth-promoting rhizobacteria, acibenzolar-S-methyl, and soil amendment for integrated management of bacterial wilt on tomato. Plant Dis. 2004; 88: 669-673. 27. Paul D, Kumar A, Anandaraj M, Sarma YR. Studies on the suppressive action of fluorescent Pseudomonas on Phytophthora capsici, the foot rot pathogen of black pepper. Indian Phytopathol. 2001; 54: 515. 28. Saharan B, Nehra V. Plant growth promoting rhizobacteria: a critical review. Life Sci Med Res. 2011; 21: 30. 29. Nadeem SM, Zahir ZA, Naveed M, Asghar HN, Arshad M. Rhizobacteria capable of producing ACC-deaminase may mitigate the salt stress in wheat. Soil Sci Soc Am J. 2010; 74: 533-542. 30. Nadeem SM, Zahir ZA, Naveed M, Ashraf M. Microbial ACC-deaminase: prospects and applications for inducing salt tolerance in plants. Crit Rev Plant Sci. 2010; 29: 360-393. 31. El-Iklil Y, Karrou M, Benichou M. Salt stress effect on epinasty in relation to ethylene production and water relations in tomato. Agron. 2000; 20: 399-406. 32. Glick BR, Cheng Z, Czarny J, Cheng Z, Duan J. Promotion of plant growth by ACC deaminase-producing soil bacteria. Eur J Plant Pathol. 2007; 119: 329-339. 33. Sun P, Tian Q, ZaoM, Dai X, Huang J, Li L, et al. Aluminum-induced ethylene production is associated with inhibition of root elongation in Lotus japonicus L. Plant Cell Physiol. 2007; 48: 1229-1265. 34. Ashraf M, Khanum A. Relationship between ion accumulation and growth in two spring wheat lines differing in salt tolerance at different growth stages. J Agron Crop Sci. 1997; 178: 39-51. 35. Iturbe-Ormaetxe I, Escuredo PR, Arrese-Igor C, BecanaM. Oxidative damage in pea plants exposed to water deficit or paraquat. Plant Physiol. 1998; 116: 173-181. 36. Saleem M, Arshad M, Hussain S, Bhatti AS. Perspective of plant growth promoting rhizobacteria (PGPR) containing ACC deaminase in stress agriculture. J Ind Microbiol Biotechnol. 2007; 34: 635-648. 37. Swaraj K, Bishnoi NR. Effect of salt stress on nodulation and nitrogen fixation in legumes. Indian J Exp Biol. 1999; 37: 843-848. 38. Singleton PW, Bohlool BB. Effects of salinity on nodule formation by soybean. Plant Physiol. 1984; 75: 72-76. 39. Ahmad M, Zahir ZA, Asghar HN, Asghar M. Inducing salt tolerance in mung bean through co-inoculation with rhizobia and plant-growth-promoting rhizobacteria containing 1-aminocyclopropane-1-carboxylate-deaminase. Can J Microbiol. 2011; 57: 578-589. 40. Ahmad M, Zahir ZA, Asghar HN, Arshad M. The combined application of rhizobial strains and plant growth promoting rhizobacteria improves growth and productivity of mung bean (Vigna radiata L.) under salt-stressed conditions. Ann Microbiol. 2012; 62: 1321-1330. 41. Bouhmouch I, Souad-Mouhsine B, Brhada F, Aurag J. Influence of host cultivars and Rhizobium species on the growth and symbiotic performance of Phaseolus vulgaris under salt stress. J Plant Physiol. 2005; 162: 1103-1113. 42. Tripathi AK, Nagarajan T, Verma SC, Le Rudulier D. Inhibition of biosynthesis and activity of nitrogenase in Azospirillum brasilense Sp7 under salinity stress. Curr Microbiol. 2002; 44: 363-367. 43. Bhargava S, Saxena RK, Pandey PK, Bisen PS. Mutational engineering of the cyanobacterium Nostoc muscorum for resistance to growth-inhibitory action of LiCl and NaCl. Curr Microbiol. 2003; 47: 5-11. 44. Sgroy V, Cassán F, Masciarelli O, Del Papa MF, Lagares A, Luna V. Isolation and characterization of endophytic plant growth-promoting (PGPB) or stress homeostasis-regulating (PSHB) bacteria associated to the halophyte Prosopis strombulifera. Appl Microbiol Biotechnol. 2009; 85: 371-381. 45. Ahmadi N, Mibus H, Serek M. Characterization of ethylene-induced organ abscission in F1 breeding lines of miniature roses (Rosa hybrida L.). Postharvest Biol Technol. 2009; 52: 260-266. 46. Dodd IC, Belimov AA, Sobeih WY, Safronova VI, Grierson D, Davies WJ. Will modifying plant ethylene status improve plant productivity in water-limited environments? Proceedings of the 4th International Crop Science Congress; 2004 Sept 26-Oct; Brisbane, Australia. 47. Ashraf M. Biotechnological approach of improving plant salt tolerance using antioxidants as markers. Biotechnol Adv. 2009; 27: 84-93. 48. Apel K, Hirt H. Reactive oxygen species: metabolism, oxidative stress, and signal transduction. Annu Rev Plant Biol. 2004; 55: 373-399. 49. Hajiboland R, Joudmand A. The K/Na replacement and function of antioxidant defence system in sugar beet (Beta vulgaris L.) cultivars. Acta Agric Scand Sect B Soil Plant Sci. 2009; 59: 246-259. 50. Abdel Latef AA. Influence of arbuscular mycorrhizal fungi and copper on growth, accumulation of osmolyte, mineral nutrition and antioxidant enzyme activity of pepper (Capsicum annuum L.). Mycorrhiza. 2011; 21: 495-503. 51. Ashraf M, Ali Q. Relative membrane permeability and activities of some antioxidant enzymes as the key determinants of salt tolerance in canola (Brassica napus L.). Environ Exp Bot. 2008; 63: 266-273. 52. Abdel Latef AA, Chaoxing H. Arbuscular mycorrhizal influence on growth, photosynthetic pigments, osmotic adjustment and oxidative stress in tomato plants subjected to low temperature stress. Acta Physiol Plant. 2010; 33: 1217-1225. 53. Gill SS, Tuteja N. Reactive oxygen species and antioxidant machinery in abiotic stress tolerance in crop plants. Plant Physiol Biochem. 2010; 48: 909-930. 54. Tunc-Ozdemir M, Miller G, Song L, Kim J, Sodek A, Koussevitzky S, et al. Thiamin confers enhanced tolerance to oxidative stress in Arabidopsis. Plant Physiol. 2009; 151: 421-432. 55. Amirjani MA. Effects of cadmium on wheat growth and some physiological factors. Int J For Soil Eros. 2012; 2: 50-58. 56. Ashraf M, Shahbaz M, Ali Q. Drought-induced modulation in growth and mineral nutrients in canola (Brassica napus L.). Pak J Bot. 2013; 45: 93-98. 57. Ashraf M, Foolad MR. Roles of glycine betaine and proline in improving plant abiotic stress resistance. Environ Exp Bot. 2007; 59: 206-216. 58. Slama I, Messedi D, Ghnaya T, Savoure A, Abdelly C. Effect of water deficit on growth and proline metabolism in Sesuvium portulacastrum. Environ Exp Bot. 2006; 56: 231-238. 59. González-Teuber M, Pozo MJ, Muck A, Svatos A, Adame-Alvarez RM, Heil M. Glucanases and chitinases as causal agents in the protection of Acacia extrafloral nectar from infestation by phytopathogens. Plant Physiol. 2010; 152: 1705-1715. 60. Ashry NA, Mohamed HI. Impact of secondary metabolites and related enzymes inflax resistance and/or susceptibility to powdery mildew. Afr J Biotechnol. 2012; 11: 1073-1077. 61. Spaepen S, Vanderleyden J. Auxin and plant-microbe interactions. Cold Spring Harb Perspect Biol. 2011; 3(4): a001438. 62. Asghar HN, Zahir ZA, Arshad M. Screening rhizobacteria for improving the growth, yield, and oil content of canola (Brassica napus L). Austral J Agricult Res. 2004; 55(Suppl 2): 187-194. 63. Burdman S, Jurkevitch E, Okon Y. Recent advances in the use of plant growth promoting rhizobacteria (PGPR) in agriculture. In: Microbial interactions in agriculture and forestry. Subba Rao NS, Dommergues YR, eds. Science Publishers: Enfield, NH, USA, 2000: 229-250. 64. Weller DM, Thomashow LS. Current challenges in introducing beneficial microorganisms into the rhizosphere. In: Molecular ecology of rhizosphere microorganisms: biotechnology and release of GMOs. O’Gara F, Dowling DN, Boesten B, eds. VCH: New York, NY, USA, 1994: 1-18. 65. Kaymak DC. Potential of PGPR in agricultural innovations. In: Plant growth and health promoting bacteria. Maheshwari DK, ed. Springer-Verlag: Berlin/Heidelberg, Germany, 2010. 66. Nautiyal CS, Govindarajan R, Lavania M, Pushpangadan P. Novel mechanisms of modulating natural antioxidants in functional foods: Involvement of plant growth promoting rhizobacteria NRRL B-30488. J Agric Food Chem. 2008; 56: 4474-4481. 67. Bhattacharyya PN, Jha DK. Plant growth-promoting rhizobacteria (PGPR): Emergence in agriculture. Wood J Microb Biotechnol. 2012; 28: 1327-1350. 68. Kloepper JW, Schroth MN. Plant growth-promoting rhizobacteria on radishes. In: Station de Pathologie. Proceedings of the 4th International Conference on Plant Pathogenic Bacteria, Tours, France, 27 August-2 September 1978; Végétale et Phyto-Bactériologie, 1978: 879-882. 69. Kloepper JW, Leong J, Teintze M, Schroth MN. Enhanced plant growth by siderophores produced by plant growth promoting rhizobacteria. Nature. 1980; 286: 885-886. 70. Son JS, Sumayo M, Hwang YJ, Kim BS, Ghim SY. Screening of plant growth promoting rhizobacteria as elicitor of systemic resistance against grey leaf spot dieses in pepper. Appl Soil Ecol. 2014; 73: 1-8. 71. Gray EJ, Smith DL. Intracellular and extracellular PGPR: commonalities and distinctions in the plant-bacterium signaling processes. Soil Biol Biochem. 2005; 37: 395-412. 72. Egamberdieva D, Lugtenberg B. Use of plant growth-promoting rhizobacteria to alleviate salinity stress in plants. In: Use of microbes for the alleviation of soil stresses. Springer: New York, NY, USA, 2014; 1: 73-96. 73. Farzana Y, Saad ROS, Kamaruzaman S. Growth and storage root development of Sweet potato inoculated with rhizobacteria under glasshouse conditions. Austral J Basic Appl Sci. 2009; 3(2): 1461-1466. 74. Burr TJ, Caesar AM, Schrolh N. Beneficial plant bacteria. Crit Rev Plant Sci. 1984; 2: 1-20. 75. Yasmin F, Othman R, Saad MS, Sijam K. Screening for beneficial properties of Rhizobacteria isolated from sweet potato rhizosphere. J Biotechnol. 2007; 6: 49-52. 76. Egamberdiyeva D. The effect of plant growth promoting bacteria on growth and nutrient uptake of maize in two different soils. Appl Soil Ecol. 2007; 36(2-3): 184-189. 77. Ryu C, Farag MA, Hu C, Reddy MS, Wei H, Paré PW, Kloepper JW. Bacterial volatiles promote growth in Arabidopsis. Proc Natl Acad Sci USA. 2003; 100(8): 4927-4932. 78. Anjum MA, Sajjad MR, Akhtar N, Qureshi MA, Iqbal A, Jami AR, Mahmud-ul-Hasan. Response of cotton to plant growth promoting Rhizobacteria (PGPR) inoculation under different levels of nitrogen. J Agric Res. 2007; 45(2): 135-143. 79. Karakurt H, Aslantas R, Ozkan G, Guleryuz M. Effects of indol-3-butyric acid (IBA), plant growth promoting rhizobacteria (PGPR) and carbohydrates on rooting of hardwood cutting of MM106 Apple rootstock. Afr J Agric Res. 2009; 4(2): 60-64. 80. Shahzad SM, Khalid A, Arshad M, Khalid M, Mehboob I. Integrated use of plant growth promoting bacteria and penriched compost for improving growth, yield and nodulating of chickpea. Pak J Bot. 2008; 40(4): 1735-1441. 81. Reinhold-Hurek B, Hurek T. Interactions of gramineous plants with Azoarcus spp. and other diazotrophs: identification, localization, and perspectives to study their function. Crit Rev Plant Sci. 1998; 17: 29-54. 82. Aloni R., Aloni E, Langhans M. Role of cytokinin and auxin in shaping root architecture: Regulating vascular differentiation, lateral root initiation, root apical dominance and root gravitropism. Ann Bot. 2006; 97: 883-893. 83. Sabry SRS, Saleh SA, Batchelor CA. Endophytic establishment of Azorhizobium caulinodans in wheat. Proc Biol Sci. 1997; 264: 341-346. 84. De Felipe MR. Fijación biológica de dinitrógeno atmosférico en vida libre. In: Fijación de Nitrógeno: Fundamentos y Aplicaciones. Granada: Sociedad Española de Microbiología. Bedmar E, Gonzálo J, Lluch C, et al. eds. Sociedad Española de Fijación de Nitrógeno: Granada, Spain, 2006: 9-16. 85. Wani SA, Chand S, Ali T. Potential use of Azotobacter chroococcum in crop production: an overview. Curr Agric Res J. 2013; 1: 35-38. 86. Ahmed A, Hasnain S. Auxin producing Bacillus sp. : auxin quantification and effect on the growth Solanum tuberosum. Pure Appl Chem. 2010; 82: 313-319. 87. Sokolova MG, Akimova GP, Vaishlia OB. Effect of phytohormones synthesized by rhizosphere bacteria on plants. Prikl Biokhim Mikrobiol. 2011; 47: 302-307. 88. Joo GJ, Kim YM, Kim JT. Gibberellins-producing rhizobacteria increase endogenous gibberellins content and promote growth of red peppers. J Microbiol. 2005; 43: 510-515. 89. Han HS, Lee KD. Phosphate and potassium solubilizing bacteria effect on mineral uptake, soil availability and growth of eggplant. Res J Agric Biol Sci. 2005; 1: 176-180. 90. Han HS, Supanjani S, Lee KD. Effect of co-inoculation with phosphate and potassium solubilizing bacteria on mineral uptake and growth of pepper and cucumber. Plant Soil Environ. 2006; 52: 130-136. 91. Van Loon LC, Bakker PAHM. Induced systemic resistance as a mechanism of disease suppression by rhizobacteria. In: Siddiqui ZA, ed. PGPR: Biocontrol and biofertilization. 2006: 39-66. 92. El-Akhal MR, Rincón A, Coba de la Peña T, Lucas MM, El Mourabit N, Barrijal S, Pueyo JJ. Effects of salt stress and rhizobial inoculation on growth and nitrogen fixation of three peanut cultivars. Plant Biol. 2013; 15: 415-421. 93. Silo-Suh LA, Lethbridge BJ, Raffel SJ. Biological activities of two fungistatic antibiotics produced by Bacillus cereus UW85. Appl Environ Microbiol. 1994; 60: 2023-2030. 94. Shen X, Hu H, Peng H, Wang W, Zhang X. Comparative genomic analysis of four representative plant growth-promoting rhizobacteria in Pseudomonas. BMC Genomics. 2013; 14: 271. 95. Dobereiner J. Nitrogen-fixing bacteria of the genus Beijerinckia Derx in the rhizosphere of sugar cane. Plant Soil. 1961; 15: 211-216. 96. Govindarajan M, Balandreau J, Kwon, SW. Effects of the inoculation of Burkholderia vietnamensis and related endophytic diazotrophic bacteria on grain yield of rice. Microb Ecol. 2007; 55: 21-37. 97. Radzki W, Gutierrez Manero FJ, Algar E. Bacterial siderophores efficiently provide iron to iron-starved tomato plants in hydroponics culture. Antonie Van Leeuwenhoek. 2013; 104: 321-330. 98. Simonet P, Normand P, Moiroud A. Identification of Frankia strains in nodules by hybridization of polymerase chain reaction products with strain-specific oligonucleotide probes. Arch Microb. 1990; 153: 235-240. 99. Muñoz-Rojas J, Caballero-Mellado J. Population dynamics of Gluconacetobacter diazotrophicus in sugarcane cultivars and its effect on plant growth. Microb Ecol. 2003; 46: 454-464. 100. Elbeltagy A, Nishioka K, Sato T. Endophytic colonization and in planta nitrogen fixation by a Herbaspirillum sp. isolated from wild rice species. Appl Environ Microbiol. 2001; 67: 5285-5293. 101. Bent E, Tuzun S, Chanway CP. Alterations in plant growth and in root hormone levels of lodgepole pines inoculated with rhizobacteria. Can J Microbiol. 2001; 47: 793-800. 102. Sangeeth KP, Bhai RS, Srinivasan V. Paenibacillus glucanolyticus, a promising potassium solubilizing bacterium isolated from black pepper (Piper nigrum L.) rhizosphere. J Spices Aromat Crops. 2012; 21: 118-124. 103. Flores-Felix JD, Silva LR, Rivera LP. Plants probiotics as a tool to produce highly functional fruits: the case of Phyllobacterium and vitamin C in strawberries. PLoS One. 2015; 10(4): e0122281. 104. Arora NK, Khare E, Oh JH. Diverse mechanisms adopted by Pseudomonas fluorescent PGC2 during the inhibition of Rhizoctonia solani and Phytophthora capsici. World J Microbiol Biotechnol. 2008; 24: 581-585. 105. Ahmad M, Zahir ZA, Khalid M. Efficacy of Rhizobium and Pseudomonas strains to improve physiology, ionic balance and quality of mung bean under salt-affected conditions on farmer’s fields. Plant Physiol Biochem. 2013; 63: 170-176. 106. Yao L, Wu Z, Zheng Y. Growth promotion and protection against salt stress by Pseudomonas putida Rs-198 on cotton. Eur J Soil Biol. 2010; 46: 49-54. 107. Mazzola M, Fujimoto DK, Thomashow LS. Variation in sensitivity of Gaeumannomyces graminis to antibiotics produced by fluorescent Pseudomonas spp. and effect on biological control of take-all of wheat. Appl Environ Microbiol. 1995; 61: 2554-2559. 108. Kumar H, Bajpai VK, Dubey RC. Wilt disease management and enhancement of growth and yield of Cajanus cajan (L) var. Manak by bacterial combinations amended with chemical fertilizer. Crop Protect. 2010; 29: 591-598. 109. Young JPW, Haukka KE. Diversity and phylogeny of rhizobia. New Phytol. 1996; 133: 87-94. 110. Thamer S, Schädler M, Bonte D. Dual benefit from a belowground symbiosis: Nitrogen fixing rhizobia promote growth and defense against a specialist herbivore in a cyanogenic plant. Plant Soil. 2011; 341: 209-219. 111. Yanni Y, Rizk R, Abd-El Fattah F. The beneficial plant growth-promoting association of Rhizobium leguminosarum bv. trifolii with rice roots. Aust J Plant Physiol. 2001; 28: 845-870. 112. Garcia-Fraile P, Carro L, Robledo M. Rhizobium promotes non-legumes growth and quality in several production steps: towards a biofertilization of edible raw vegetables healthy for humans. PLoS ONE. 2012; 7(5): e38122. 113. Flores-Felix JD, Menendez E, River LP. Use of Rhizobium leguminosarum as a potential biofertilizer for Lactuca sativa and Daucus carota crops. J Plant Nutr Soil Sci. 2013; 176: 876-882. 114. Vessey JK. Plant growth promoting rhizobacteria as biofertilizers. Plant Soil. 2003; 255: 571-586. 115. Ramos-Solano B, Barriuso J, Gutiérrez-Mañero FJ. Physiological and molecular mechanisms of plant growth promoting rhizobacteria (PGPR). In: Ahmad I, Pichtel J, Hayat S, eds. Plant-bacteria interactions: strategies and techniques to promote plant growth, 2008: 41-54. 116. Aeron A, Kumar S, Pandey P, Maheshwari DK. Emerging role of plant growth promoting rhizobacteria in agrobiology. In: Maheshwari DK, ed. Bacteria in agrobiology: crop ecosystems. 2011: 1-36. 117. Govindasamy V, Senthilkumar M, Magheshwaran V, Kumar U, Bose P, Sharma V, Annapurna K. Bacillus and Paenibacillus spp. : potential PGPR for sustainable agriculture. In: Maheshwari DK, ed. Plant growth and health promoting bacteria. 2011: 333-364. 118. Tilak KVBR, Ranganayaki N, Pal KK, De R, Saxena AK, Nautiyal CS, Mittal S, et al. Diversity of plant growth and soil health supporting bacteria. Curr Sci. 2005; 89: 136-150. 119. Egamberdiyeva D. Plant-growth-promoting rhizobacteria isolated from a Calcisol in a semi-arid region of Uzbekistan: biochemical characterization and effectiveness. J Plant Nutr Soil Sci. 168; 2005: 94-99. 120. Curl EA, Truelove B. The rhizosphere. Springer Verlag, Berlin-Heidelberg, 2008. 121. Hallmann J, Quandt-Hallmann A, Mahaffee WF, Kloepper JW. Bacterial endophytes in agricultural crops. Can J Microbiol. 1997; 43(10): 895-914. 122. Barraquio WL, Segubre EM, Gonzalez MS, Verma SC, James EK, Ladha JK, Tripathi AK, Diazotrophic enterobacteria: what is their role in the rhizosphere? In: The quest for nitrogen fixation in rice. Ladha JK, Reddy PM, eds. IRRI, Manila, 2000: 93-118. 123. Ştefan M, Mihasan M, Dunca S. Plant growth promoting rhizobacteria can inhibit the in vitro germination of Glycine max L seeds. Sci Ann Univ Alexandru Ioan Cuza Iasi Sect Gen Mol Biol. 2008; 9(3): 105-110. 124. Chaiharn M, Chunhaleuchanon S, Kozo A, Lumyong S. Screening of Rhizobacteria for their plant growth promoting activities. KMITL Sci Technol J. 2008; 8: 18-23. 125. Rokhzadi A, Asgharzadeh A, Darvish F, Nour-Mohammadi G, Majidi E. Influence of plant growth promoting rhizobacteria on dry matter accumulation of chickpea (Cicer arietinum L) under field conditions. J Agric Environ Sci. 2008; 3(2): 253-257. 126. Graham PH. Principles and application of soil microbiology. 1988: 322-345. 127. Young JPW. Phylogenetic classification of nitrogen-fixing organisms. In: Biological nitrogen fixation. Stacey G, Burris RH, Evans HJ, eds. Chapman and Hall New York, 1992: 43-86. 128. Schwintzer R, Tjepkema JD. The biology of Frankia and actinorrhizal plants. Academic Press Inc. San Diego, USA, 1990: 99. 129. Wheeler CT, Miller JM, Current and potential uses of actinorrhizal plants in Europe. In: The biology of Frankia and actinorrhizal plants. Schwintzer CR, Tjepkema JD, eds. Academic Press, San Diego, USA, 1990: 365-389. 130. Huss-Danell K, The physiology of actinorrhizal roots. In: The biology of Frankia and actinorrhizal plants. Schwintzer CR, Tjepkema JD, eds. Academic Press, San Diego, USA, 1990: 128-156. 131. Werner D. Symbiosis of plants and microbes. Chapman and Hall, New York, 1992: 387-400. 132. Dommergues YR, Bosco M. The contribution of N2-fixing trees to soil productivity and rehabilitation in tropical, subtropical and Mediterranean regions. In: Microbial interactions in agriculture and forestry. Subba Rao NS, Dommergues YR, eds. Oxford & IBH, New Delhi, 1998: 65-96. 133. Yanni YG, Rizk RY, Corich V, Squartini A, Ninke K, Philip-Hollingsworth S. Natural endophytic association between Rhizobium leguminosarum bv. trifoliiand rice roots and assessment of its potential to promote rice growth. Plant Soil. 1997; 194(1-2): 99-114. 134. Antoun H, Beauchamp CJ, Goussard N, Chabot R, Lalande R. Potential of Rhizobium and Bradyrhizobium species as plant growth promoting rhizobacteria on non-legumes: effect on radishes (Raphanus sativus L). Plant Soil. 1998; 204: 57-67. 135. Sahgal M, Johri BN. The changing face of rhizobial systematics. Curr Sci. 2003; 84(1): 43-48. 136. Alikhani HA, Saleh-Rastin N, Antoun H. Phosphate solubilization activity of rhizobia native to Iranian soils. Plant Soil. 2006; 287(Suppl 1-2): 35-41. 137. Afzal A, Bano A. Rhizobium and phosphate solubilizing bacteria improve the yield and phosphorus uptake in wheat (Triticum aestivum). Int J Agric Biol. 2008; 10(Suppl 1): 85-88. 138. Somasegaran P. Handbook for rhizobia: methods in legume-rhizobium technology. New York: Springer-Verlag. 1994: 1-6: 167. 139. Polenko DR, Scher FM, Kloepper JW, Singleton CA, Laliberte M, Zaleska I. Effects of root colonizing bacteria on nodulation of soybean roots by Bradyrhizobium japonicam. Can J Microbiol. 1987; 33: 498-503. 140. Yahalom E, Okon Y, Dovrat A. Azospirillum effects on susceptibility to Rhizobium nodulation and on nitrogen fixation of several forage legumes. Can J Microbiol. 1987; 33(Suppl 6): 510-514. 141. Son TTN, Diep CN, Giang TTM. Effect of Bradyrhizobia and phosphate solubilizing bacteria application on soybean in rotational system in the Mekong delta. Omonrice. 2006; 14: 48-57. 142. Vessey JK. Plant growth promoting rhizobacteria as biofertilizers. Plant Soil. 2003; 255(Suppl 2): 571-586. 143. Barriuso J, Solano BR. Ecology, genetic diversity and screening strategies of plant growth promoting rhizobacteria (PGPR). J Plant Nutr. 2008: 1-17. 144. Saxena AK, Tilak KVBR, Free-living nitrogen fixers: its role in crop production. In: Microbes for health, wealth and sustainable environment. Verma AK, ed. Malhotra Publ Co, New Delhi, 1998: 25-64. 145. Dobereiner J, Day JM. Nitrogen fixation in rhizosphere of grasses. In: Nitrogen fixation by free-living microorganisms. Stewart WDP, ed. Cambridge University Press, 1975: 39-56. 146. Gholami A, Shahsavani S, Nezarat S. The effect of Plant Growth Promoting Rhizobacteria (PGPR) on germination, seedling growth and yield of maize. Int J Biol Life Sci. 2009; 1(Suppl 1): 35-40. 147. Tilak KVBR, Saxena AK, Azospirillum - its impact on crop production. In: Recent advances in biofertilizer technology. Yadav AK, Motsara MR, Ray Chauduri S, eds. Society for Promotion & Utilization of Resources and Technology, New Delhi, 2001: 176-189. 148. Saxena AK, Tilak KVBR, Potentials and prospects of Rhizobium biofertilizer. In: Current trends in life sciences. Agromicrobes, 1999. 149. Shaukat K, Affrasayab S, Hasnain S, Growth responses of Helianthus annus to plant growth promoting rhizobacteria used as a biofertilizer. J Agric Res. 2006; 1(Suppl 6): 573-581. 150. Saikia N, Brezbaruah B, Iron-dependent plant pathogen inhibition through Azotobacter RRLJ 203 isolated from iron-rich acid soils. Indian J Exp Biol. 1995; 33: 571-575. 151. Sen J. The role of associated nitrogen-fixing bacteria on nitrogen nutrition of cereal crops. Agric J India. 1929; 24: 967-980. 152. Dewan GI, Subba Rao NS. Seed inoculation with Azospirillum brasilense and Azotobacter chroococcum and the root biomass of rice (Oryza sativa L). Plant Soil. 1979; 53(Suppl 3): 295-302. 153. Okon Y, Kapulnik Y. Development and function of Azospirillum inoculated roots. Plant Soil. 1986; 90(Suppl 1-3): 3-16. 154. García JAL, Probanza A, Ramos B, Flores JJC, Mañero FJG. Effects of Plant Growth Promoting Rhizobacteria (PGPRs) on the biological nitrogen fixation, nodulation, and growth of Lupinus albus L cv. Multolupa. Eng Life Sci. 2004; 4(Suppl 1): 71-77. 155. Magalhães FM, Baldani JI, Souto SM, Kuykendall Jr Döbereiner JA. New acid-tolerant Azospirillum species. Anais Acad Brasil Ciên. 1983; 55(Suppl 4): 417-430. 156. Tarrand JJ, Krieg NR, Döbereiner JA. Taxonomic study of the Spirillum lipoferum group with description of a new genus, Azospirillum gen. nov. and two species, Azospirillum lipoferum (Beijerinck) comb. nov. And Azospirillum brasilense nov. Can J Microbiol. 1978; 24(Suppl 8): 967-980. 157. Reinhold B, Hurek T, Fendrik I, Pot B, Gillis M, Kersters K, et al. Azospirillum halopraeferens sp. nov., a nitrogen-fixing organism associated with roots of kallar grass (Leptochloa fusca (L) Kunth). Int J Syst Bacteriol. 1987; 37: 43-51. 158. Dekhil SB, Cahill M, Stackebrandt E, Li S. Transfer of Conglomeromonas largomobilis subsp. largomobilis to the genus Azospirillum as Azopirillum largomobile comb. nov., and elevation of Conglomeromonas largomobilis subsp. parooensis to the new type species of Conglomeromonas, Conglomeromonas parooensis sp. Syst Appl Microbiol. 1997; 20: 72-77. 159. Khammas KM, Ageron E, Grimont PA, Kaiser P. Azospirillum irakense sp. nov., a nitrogen-fixing bacterium associated with rice roots and rhizosphere soil. Res Microbiol. 1989; 140(Suppl 9): 679-693. 160. Eckert B, Weber OB, Kirchof G, Halbritter A, Stoffels M, Hartmann A. Azospirillum doebereinerae sp. nov., a nitrogen fixing bacterium associated with the C4-grass Miscanthus. Int J Syst Evol Microbiol. 2001; 51(Suppl 1): 17-26. 161. Peng G, Wang H, Zhang G, Hou W, Liu Y, Wang ET, Tan Z. Azospirillum melinis sp. nov., a group of diazotrophs isolated from tropical molasses grass. Int J Syst Evol Microbiol. 2006; 56(Suppl 6): 1263-1271. 162. Xie CH, Yokota A. Azospirillum oryzae sp. nov, a nitrogen-fixing bacterium isolated from the roots of the rice plant Oryza sativa. Int J Syst Evol Microbiol. 2005; 55(Suppl 4): 1435-1438. 163. Bashan Y, Holguin G. Azospirillum-plant relations: environmental and physiological advances (1990-1996). Can J Microbiol. 1997; 43: 103-121. 164. Jha CK, Saraf M. Plant growth promoting rhizobacteria (PGPR): a review. J Agric Res Dev. 2015; 5: 108-119. 165. Goswami D, Dhandhukia P, Patel P, Thakker JN. Screening of PGPR from saline desert of Kutch: Growth promotion in Arachis hypogea by Bacillus licheniformis A2. Microbiol Res. 2014; 169: 66-75. 166. Goswamiet D, Patel K, Parmar S, Vaghela H, Muley N, Dhandhukia P, Thakker JN. Elucidating multifaceted urease producing marine Pseudomonas aeruginosa BG as a cogent PGPR and bio-control agent. Plant Growth Reg. 2015; 75(1): 253-263. 167. Goswami D, Pithwa S, Dhandhukia P, Thakker JN. Delineating Kocuria turfanensis 2M4 as a credible PGPR: a novel IAA-producing bacteria isolated from saline desert. J Plant Int. 2014; 9: 566-576. 168. Chen YP, Rekha PD, Arun AB, Shen FT, Lai WA, Young CC. Phosphate solubilizing bacteria from subtropical soil and their tricalcium phosphate solubilizing abilities. Appl Soil Ecol. 2006; 34(Suppl 1): 33-41. 169. Igual JM, Valverde A, Cervantes E, Velazquez E. Phosphate-solubilizing bacteria as inoculants for agriculture: use of updated molecular techniques in their study. Agronomie. 2001; 21(Suppl 6-7): 561-568. 170. Zaidi, Khan MS, Ahemad M, Oves M. Plant growth promotion by phosphate solubilizing bacteria. Acta Microbiol Immunol Hungar. 2009; 56(Suppl 3): 263-284. 171. Yazdani M, Bahmanyar MA, Pirdashti H, Esmaili MA. Effect of phosphate solubilization microorganisms (PSM) and plant growth promoting rhizobacteria (PGPR) on yield and yield components of corn (Zea mays L). World Acad Sci Eng Technol. 2009; 49: 90-92. 172. Attia M, Ahmed MA, El-Sonbaty MR. Use of biotechnologies to increase growth, productivity and fruit quality of Maghrabi Banana under different rates of phosphorous. World J Agric Sci. 2009; 5(Suppl 2): 211-220. 173. Chabot R, Antoun H, Cescas MP. Stimulation in the growth of corn and romaine lettuce by microorganisms dissolving inorganic phosphorus. Can J Microbiol. 1993; 39: 941-947. 174. Patel K, Goswami D, Dhandhukia P, Thakker J. Techniques to study microbial phytohormones. In: Bacterial metabolites in sustainable agroecosystem. Maheshwari DK, ed. Springer International. 2015: 1-27. 175. Halder AK, Chakrabartty PK. Solubilization of inorganic phosphate by rhizobium. Folia Microbiol. 1993; 38: 325-330. 176. Halder AK, Mishra AK, Bhattacharyya P, Chakrabartty PK. Solubilization of rock phosphate by Rhizobium and Bradyrhizobium. J Gen Appl Microbiol.1990; 36: 81-92. 177. Banik S, Dey BK. Available phosphate content of an alluvial soil as influenced by inoculation of some isolated phosphate-solubilizing micro-organisms. Plant Soil. 1982; 69: 353-364. 178. Kucey RMN, Janzen HH, Leggett ME. Microbially mediated increases in plant-available phosphorus. Adv Agron. 1989; 42: 199-228. 179. Lugtenberg BJ, Chin A-Woeng TF, Bloemberg GV. Microbeeplant interactions: principles and mechanisms. Antonie Van Leeuwenhoek. 2002; 81: 373-383. 180. Somers E, Vanderleyden J, Srinivasan M. Rhizosphere bacterial signalling: a love parade beneath our feet. Crit Rev Microbiol. 2004; 30: 205-240. 181. Ryu R, Patten CL. Aromatic amino acid-dependent expression of indole-3-pyruvate decarboxylase is regulated by 4 TyrR in Enterobacter cloacae UW5. Am Soc Microbiol. 2008; 190(Suppl 21): 1-35. 182. Spaepen S, Vanderleyden J, Remans R. Indole-3-acetic acid in microbial and microorganism-plant signalling. FEMS Microbiol Rev. 2007; 31(Suppl 4): 425-448. 183. Khalid A, Arshad M, Zahir ZA. Screening plant growth-promoting rhizobacteria for improving growth and yield of wheat. J Appl Microbiol. 2004; 96(Suppl 3): 473-480. 184. Arshad M, Frankenberger WT. Microbial production of plant hormones. Plant Soil. 1991; 133(Suppl 1): 1-8. 185. Sarwar M, Frankenberger WT. Influence of L-tryptophan and auxins applied to the rhizosphere on the vegetative growth of Zea mays L. Plant Soil. 1994; 160(Suppl 1): 97-104. 186. Ahmad F, Ahmad I, Khan MS. Indole acetic acid production by the indigenous isolates of Azotobacter and fluorescent Pseudomonas in the presence and absence of tryptophan. Turk J Biol. 2005; 29: 29-34. 187. Tsavkelova EA, Cherdyntseva TA, Klimova SY, Shestakov AI, Botina SG, Netrusov AI. Orchid-associated bacteria produce indole-3-acetic acid, promote seed germination, and increase their microbial yield in response to exogenous auxin. Arch Microbiol. 2007; 188(Suppl 6): 655-664. 188. Giongo A, Beneduzi A, Ambrosini A, Vargas LK, Stroschein MR, Eltz FL, et al. Plant growth promoting bacteria isolated from the rhizoplane of Lupinus albescens H. et Arn. XXXI Congresso Brasileiro De Ciencia Do Solo, 2007. 189. Mandal SM, Mondal KC, Dey S, Pati BR. Optimization of cultural and nutritional conditions for indol-3-acetic acid (IAA) production by a Rhizobium sp. isolated from rot nodules of Vigna mungo (L) hepper. Res J Microbiol. 2007; 2(3): 239-246. 190. Basu PS, Ghosh AC. Production of indole acetic acid in cultures by a Rhizobium species from the root nodules of a monocotyledonous tree Roystonea regia. Acta Biotechnol. 2001; 21: 65-72. 191. Ghosh AC, Basu PS. Growth behaviour and bioproduction of indole acetic acid by a Rhizobium species isolated from root nodules of a leguminous tree Dalbergia lanceolarea. Indian J Exp Biol. 2002; 40: 796-801. 192. Roy M, Basu PS. Studies on root nodules of leguminous plants bioproduction of indole acetic acid by a Rhizobium sp. from a twiner Clitorea ternatea L. Acta Biotechnol. 2004; 12: 453-460. 193. Sridevi M, Mallaiah KV. Bioproduction of indole acetic acid by Rhizobium strains isolated from root nodules of green manure crop, Sesbania sesban (L) Merr. Iran J Biotechnol. 2007; 5(Suppl 3): 178-182. 194. Etesami H, Alikhani HA, Jadidi M, Aliakbari A. Effect of superior IAA producing rhizobia on N, P, K uptake by wheat grown under greenhouse condition. World J Appl Sci. 2009; 6(12): 1629-1633. 195. Sridevi M, Yadav NCS, Mallaiah KV. Production of Indol-acetic acid by Rhizobium isolates from Crotalaria species. Res J Microbiol. 2008; 3(Suppl 4): 276-281. 196. Costacurta A, Keijers V, Vanderleyden J. Molecular cloning and sequence analysis of an Azospirillum brasilense indole-3-acetic pyruvate decarboxylase gene. Mol Gen Genet. 1994; 243: 463-472. 197. Martínez-Morales LJ, Soto-Urzúa L, Baca BE, Sánchez-Ahédo JA. Indole-3-butyric acid (IBA) production in culture medium by wild strain Azospirillum brasilense. FEMS Microbiol Lett. 2003; 228: 167-173. 198. Bottini R, Fulchieri M, Pearce D, Pharis RP. Identification of gibberellins A1, A3 and iso-A3 in culture of Azospirillum lipoferum. Plant Physiol. 1989; 90(Suppl 1): 45-47. 199. Horemans S, de Koninck K, Neuray J, Hermans R, Valassak K. Production of plant growth substances by Azospirillum sp. and other rhizosphere bacteria. Symbiosis. 1986; 2: 341-346. 200. Cacciari I, Lippi D, Ippoliti S, Pietrosanti W, Pietrosanti W. Response to oxygen of diazotrophic Azospirillum brasiliense-Arthobacter giacomelloi mixed batch culture. Arch Microbiol. 1989; 152: 111-114. 201. Idris SE, Iglesias DJ, Talon M, Borriss R. Tryptophan-dependent production of indole-3-acetic acid (IAA) affects level of plant growth promotion by Bacillus amyloliquefaciens FZB42. Mol Plant-Microbe Interact. 2007; 20(6): 619-626. 202. Tien TM, Gaskin MH, Hubbell DH. Plant growth substances produced by Azospirillum brasilense and their effect on the growth of pearl millet (Pennisetum americanum L). Appl Environ Microbiol. 1979; 37(Suppl 5): 1016-1024. 203. Reid MS. The role of ethylene in flower senescene. Acta Hortic. 1981; 261: 157-169. 204. Li Q, Saleh-Lakha S, Glick BR. The effect of native and ACC deaminasecontaining Azospirillum brasilense Cdl843 on the rooting of carnation cuttings. Can J Microbiol. 2005; 51: 511-514. 205. Liu F, Xing S, Ma H. Cytokinin-producing, plant growth-promoting rhizobacteria that confer resistance to drought stress in Platycladus orientalis container seedlings. Appl Microbiol Biotechnol. 2013; 97(20): 9155-9164. 206. Jackson MB. Ethylene in root growth and development. In: The plant hormone ethylene. Matoo AK, Suttle JC, eds. CRC Press: Boca Raton, FL, USA, 1991: 159-181. 207. Payne SM. Detection, isolation, and characterization of siderophores. Methods Enzymol. 1994; 235: 329-344. 208. Miethke M, Marahiel M. Siderophore-based iron acquistion and pathogen control. Microbiol Mol Biol Rev. 2007; 71(3): 413-451. 209. Vacheron J, Desbrosses G, Bouffaud ML, Touraine B, Moënne-Loccoz Y, Muller D. Plant growth-promoting rhizobacteria and root system functioning. Front Plant Sci. 2013; 17(4): 356. 210. Duffy BK, Défago G. Environmental factors modulating antibiotic and siderophore biosynthesis by Pseudomonas fluorescens biocontrol strains. Appl Environ Microbiol. 1999; 65(Suppl 6): 2429-2438. 211. Haas D, Défago G. Biological control of soil-borne pathogens by fluorescent pseudomonads. Nature Rev Microbiol, 2005; 3(4): 307-319. 212. Glick BR. The enhancement of plant growth by freeliving bacteria. Can J Microbiol, 1995; 41: 109-117. 213. Wong WS, Tan SN, Ge L, Chen X, Yong JWH. The importance of phytohormones and microbes in biofertilizers. In: Bacterial metabolites in sustainable agroecosystem. Maheshwari DK, ed. Springer International, 2015: 105-158. 214. Sridevi M, Mallaiah KV. Production of hydroxamate-type of siderophore by Rhizobium strains from Sesbania sesban (L). Int J Soil Sci. 2008; 3: 28-34. 215. Joshi FR, Desai DK, Archana G, Desai AJ. Enhanced survival and nodule occupancy of Pigeon pea nodulating Rhizobium sp. ST1 expressing fegA gene of Bradyrhizobium japonicum. J Biol Sci. 2009; 9: 40-51. 216. Jurkevitch E, Hadar Y, Chen Y. Differential siderophore utilization and iron uptake by soil and rhizosphere bacteria. Appl Environ Microbiol. 1992; 58: 119-124. 217. Prashant DS, Makarand RR, Bhushan LC, Sudhir BC. Siderophoregenic Acinetobacter calcoaceticus isolated from wheat rhizosphere with strong PGPR activity. Malaysian J Microbiol. 2009; 5: 6-12. 218. Suttiviriya P, Vajrodaya S, Thamchaipenet A. Production of plant growth promoting agents from endophytic Actinomycetes. 34th Congress on Science and Technology of Thailand, 2008: 1-5. 219. Loper JE, Henkels MD. Utilization of heterologous siderophores enhances levels of iron available to Pseudomonas putida in the rhizosphere. Appl Environ Microbiol. 1999; 65(Suppl 12): 5357-5363. 220. Husen E. Screening of soil bacteria for plant growth promotion activities in vitro. Indonesian J Agric Sci. 2003; 4(Suppl 1): 27-31. 221. Chakraborty U, Chakraborty B, Basnet M. Plant growth promotion and induction of resistance in Camellia sinensis by Bacillus megaterium. J Basic Microbiol. 2006; 46(Suppl 3): 186-195. 222. Gangwar M, Kaur G. Isolation and characterization of endophytic bacteria from endorhizosphere of sugarcane and ryegrass. Int J Microbiol. 2009; 7(Suppl 1): 1-5. 223. Loper JE, Henkels MD. Availability of iron to Pseudomonas fluorescens in rhizosphere and bulk soil evaluated with an ice nucleation reporter gene. Appl Environ Microbiol. 1997; 63(Suppl 1): 99-105. 224. Whipps JM. Microbial interactions and biocontrol in the rhizosphere. J Exp Bot. 2001; 52(Suppl 1): 487-511. 225. Neilands JB. A Crystalline organo-iron pigment from a rust fungus (Ustilago sphaerogena). J Am Chem Soc. 1952; 74(Suppl 19): 4846-4847. 226. Neilands JB. Siderophores: structure and function of microbial iron transport compounds. J Biol Chem. 1995; 270(Suppl 45): 26723-26726. 228. Chet I, Ordentlich A, Shapira R, Oppenheim A. Mechanisms of biocontrol of soil-borne plant pathogens by rhizobacteria. Plant Soil., 1990; 129: 85-92. 229. Kobayashi DY, Reedy RM, Bick J, Oudemans PV. Characterization of a chitinase gene from Stenotrophomonas maltophilia strain 34S1 and its involvement in biological control. Appl Environ Microbiol. 2002; 68: 1047-1054. 230. Compant S, Duffy B, Nowak J, Clement C, Barka EA. Use of plant growth-promoting bacteria for biocontrol of plant diseases: principles, mechanisms of action, and future prospects. Appl Environ Microbiol. 2005; 71: 4951-4959. 231. Sadfi N, Cherif M, Fliss I, Boudabbous A, Antoun H. Evaluation of bacterial isolates from salty soils and Bacillus thuringiensis strains for the biocontrol of Fusarium dry rot of potato tubers. J Plant Path. 2001; 83: 101-117. 232. Neiendam-Nielsen M, Sørensen, J. Chitinolytic activity of Pseudomonas fluorescens isolates from barley and sugar beet rhizosphere. FEMS Microbiol Ecol. 1999; 30: 217-227. 233. Budi SW, Van-Tuinen D, Arnould C, Dumas-Gaudot E, Gianinazzi-Pearson V, Gianinazzi S. Hydrolytic enzyme activity of Paenibacillus sp. strain B2 and effects of the antagonistic bacterium on cell integrity of two soilborne pathogenic fungi. Appl Soil Ecol. 2000; 15: 191-199. 234. Someya N, Kataoka N, Komagata T, Hirayae K, Hibi T, Akutsu K. Biological control of cyclamen soilborne diseases by Serratia marcescens strain B2. Plant Dis. 2000; 84(3): 334-340. 235. Felse PA, Panda T. Production of microbial chitinases - a revisit. Bioprocess Engin. 2000; 23(2): 127-134. 236. Ahmad P, Prasad MNV. Environmental adaptations and stress tolerance of plants in the era of climate change. Berlin: Springer Science & Business Media, 2011. 237. Azooz MM, Youssef AM, Ahmad P. Evaluation of salicylic acid (SA) application on growth, osmotic solutes and antioxidant enzyme activities on broad bean seedlings grown under diluted seawater. Int J Plant Physiol Biochem. 2011; 3: 253-264. 238. Parvaiz A, Khalid URH, Ashwani K, Muhammad A, Nudrat AA. Salt-induced changes in photosynthetic activity and oxidative defense system of three cultivars of mustard (Brassica juncea L.). Afr J Biotechnol. 2012; 11: 2694-2703. 239. Zahedi AM, Fazeli I, Zavareh M, Dorry H, Gerayeli N. Evaluation of the sensitive components in seedling growth of common bean (Phaseolus vulgaris L.) affected by salinity. Asian J Crop Sci. 2012; 4: 159-164. 240. Rasool S, Ahmad A, Siddiqi TO, Ahmad P. Changes in growth, lipid peroxidation and some key antioxidant enzymes in chickpea genotypes under salt stress. Acta Physiol Plant. 2013; 35: 1039-1050. 241. Koyro HW, Ahmad P, Geissler N. Abiotic stress responses in plants: An overview. In: Environmental adaptations and stress tolerance of plants in the era of climate change. Ahmad P, Prasad MNV, eds. 2012: 1-28. 242. Silva HSA, Romeiro RDS, Macagnan D, Halfeld-Vieira BDA, Pereira MCB, Mounteer, A. Rhizobacterial induction of systemic resistance in tomato plants: non-specific protection and increase in enzyme activities. Biol Control. 2004; 29: 288-295. 243. Chun JW, Ya HG, Chao W, Hong XL, Dong DN, Yun PW, Jian HG. Enhancement of tomato (Lycopersicon esculentum) tolerance to drought stress by plant-growth-promoting rhizobacterium (PGPR) Bacillus cereus AR156. J Agric Biotechnol. 2012; 20: 1097-1105. 244. Leclere V, Bechet M, Adam A, Guez JS, Wathelet B, Ongena M, Thonart P. Mycosubtilin overproduction by Bacillus subtilis BBG100 enhances the organism’s antagonistic and biocontrol activities. Appl Environ Microbiol. 2005; 71: 4577-4584. 245. Hammer PE, Hill DS, Lam ST, Van Pée, KH, Ligon JM. Four genes from Pseudomonas fluorescens that encode the biosynthesis of pyrrolnitrin. Appl Environ Microbiol. 1997; 63: 2147-2154. 246. Dutta S, Podile AR. Plant growth promoting rhizobacteria (PGPR): the bugs to debug the root zone. Crit Rev Microbiol. 2010; 36: 232-244. 247. Chang WT, Chen YC, Jao CL. Antifungal activity and enhancement of plant growth by Bacillus cereus grown on shellfish chitin wastes. Biores Technol. 2007; 98: 1224-1230. 248. Bharti P, Tewari R. Purification and structural characterization of a phthalate antibiotic from Burkholderia gladioli OR1 effective against multi-drug resistant Staphylococcus aureus. J Microb Biotech Food Sci. 2015; 5: 207. 249. Fernando WD, Nakkeeran S, Zhang Y. Biosynthesis of antibiotics by PGPR and its relation in biocontrol of plant diseases. In: PGPR: biocontrol and biofertilization. 2005: 67-109. 250. Viveros OM, Jorquera MA, Crowley DE, Gajardo G, Mora ML. Mechanisms and practical considerations involved in plant growth promotion by rhizobacteria. J Soil Sci Plant Nutr. 2010; 10: 293-319. 251. De Souza JT, Arnould C, Deulvot C, Lemanceau P, Gianinazzi-Pearson V. Effect of 2,4-diacetylphloroglucinol on Pythium: cellular responses and variation in sensitivity among propagules and species. Phytopathology. 2003; 93: 966-975. 252. Maksimov I, Abizgil Dina R, Pusenkova L. Plant growth promoting rhizobacteria as alternative to chemical crop protectors from pathogens (review). Appl Biochem Microbiol. 2011; 47: 333-345. 253. Romero D, de Vicente A, Rakotoaly RH, Dufour SE, Veening JW, et al. The iturin and fengycin families of lipopeptides are key factors in antagonism of Bacillus subtilis toward Podosphaera fusca. Mol Plant-Microbe Interact. 2007; 20: 430-440.